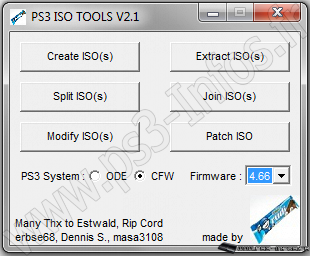 PS3 ISO Tools par Rudi Rastelli est un outil "tout-en-un" vous permettant de manipuler les ISO de vos jeux préférés. Vous pourrez ainsi transformer des jeux au format JB (dossier) en ISO, splitter les iso pour les mettre sur une partition FAT32, ainsi que patcher le jeu pour être compatible avec une version inférieure de firmware. A noter que cet outil est compatible pour les utilisateurs de CFW, mais également les possesseurs d'ODE. Permet de renommer un ISO-PS3 (splitté ou non), en regardant les info du jeu contenue dans le fichier "PARAM.SFO"
- It's important to set up your PS3-System on main window, because PS3 ISO TOOLS will make some preselections depending from that. - All other tools, with the exception of ISO-Patcher, support batch-operation as well. Just multi-select the ISOs you like to process. - After conversion/extraction a log-file will be shown, which compares size and number of files. - 'Proper' patching is possible only for 3.55, because ps3-private-keys above 3.55, which are needed for signing, are not yet released to the public. - If you've choosen to extract "PARAM.SFO" and "ICON0.PNG"(Game-Icon) while converting to ISO-format, the 2 files will be placed hidden as "[ISO-name].SFO" and "[ISO-name].PNG" at target-folder. If you use webMAN copy these 2 files(per game) to "/dev_hdd0/tmp/wmtmp/". This will save you the effort to mount each game at least once to make webMAN display it's game-icon. - Make sure game-folder or any file inside game-folder isn't opened in any way before starting conversion. - Aborted batch-conversions could be continued. Already finished conversions will be skipped. - Find the options to patch a game to a lower firmware within the "Create ISO(s) Options". If PS3 ISO TOOLS does not patch anything and game doesn't work try the "Always"-Option. to the game-folder and you're done. !!! MAIN INTENTION FOR THIS NEW VERSION WAS ODE COMPATIBILITY !!! The new patch functionality can be found at "ISO Conversion Options"
Note 3: This will only work for CFW-User... so it's greyed out when u set up an ODE-system. !!! FOR MORE INFORMATION PLEASE READ THE README AND THE TOOLTIPS !! !